In its 0300 GMT advisory, the National Hurricane Center said the maximum sustained winds of Florence were 150 kilometers per hour, dropping it to the weakest of five categories on the Saffir-Simpson scale. 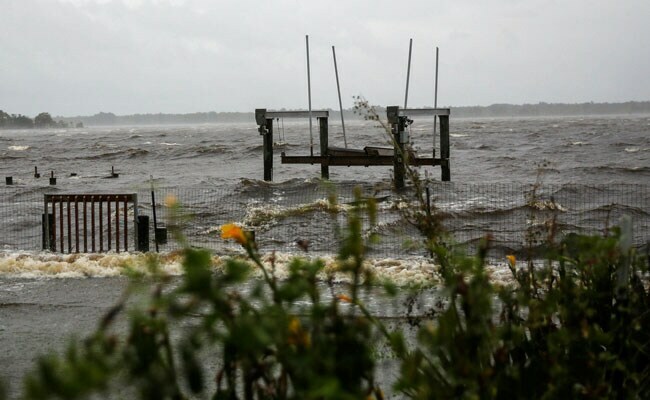 The US east coast girded for a battering from Hurricane Florence late Thursday as the monster storm's outer edge began lashing the Carolinas with heavy wind and rain, which forecasters warned could trigger life-threatening floods even as it further weakened. In its 0300 GMT advisory, the National Hurricane Center said the maximum sustained winds of Florence were 90 miles per hour (150 kilometers per hour), dropping it to the weakest of five categories on the Saffir-Simpson scale. But the storm still carried "very dangerous winds," the Center added. On Wednesday, Florence was downgraded twice from its peak as a Category 4 storm which causes "catastrophic damage." It is now at Category 1. Hurricane-force winds began whipping North Carolina as federal emergency management officials warned that the hurricane remained a "very dangerous storm" capable of wreaking havoc along a wide swathe of the coast. "Just because the wind speed came down, the intensity of this storm came down to a Cat 2, please do not let your guard down," said Brock Long, the administrator of the Federal Emergency Management Agency (FEMA), speaking earlier Thursday. Warning of looming storm surges of nine to 12 feet (2.7-3.6 meters), he urged residents to take the storm seriously no matter the category, saying "this is all about the water, anyway." With winds picking up along the coastline early Thursday, federal and state officials had issued final appeals to residents to get out of the path of the "once in a lifetime" weather system. "This storm will bring destruction," North Carolina Governor Roy Cooper said. "Catastrophic effects will be felt." Some minor flooding was reported on the Outer Banks -- barrier islands off the coast of North Carolina -- and in some seaside coastal towns, as more than 110,000 power outages were reported statewide. In Wilmington, North Carolina, a steady rain began to fall as gusts of winds intensified, causing trees to sway and stoplights to flicker. Avair Vereen, 39, took her seven children to a shelter in Conway High School near Myrtle Beach, South Carolina. "We live in a mobile home so we were just like 'No way,'" she said. "If we lose the house, oh well, we can get housing. "But we can't replace us so we decided to come here." At 11:00 pm (0300 GMT), Florence was over the Atlantic Ocean about 60 miles (95 kilometers) east-southeast of Wilmington, North Carolina, and moving northwest at six miles per hour, the NHC said. Steve Goldstein of the National Oceanic and Atmospheric Administration said Florence's forward motion had slowed and it was not expected to make landfall in the Carolinas until "some time Friday afternoon, Friday evening or Saturday morning." He said hurricane-force winds extended outward 80 miles from the center of the storm and tropical storm-force winds extended nearly 200 miles out. Some areas could receive as much as 40 inches (one meter) of rain, forecasters said. "This rainfall will produce catastrophic flash flooding and prolonged significant river flooding," the NHC said. A tornado watch was also in effect for parts of North Carolina. FEMA's Long warned the danger was not only along the coast: "Inland flooding kills a lot of people, unfortunately, and that's what we're about to see," he said. About 1.7 million people in North Carolina, South Carolina and Virginia are under voluntary or mandatory evacuation orders and millions of others live in areas likely to be affected by what officials called a "once in a lifetime" storm. Myrtle Beach, a South Carolina beach resort, was virtually deserted with empty streets, boarded up storefronts and very little traffic. A state of emergency has been declared in five coastal states -- North Carolina, South Carolina, Georgia, Maryland and Virginia. Duke Energy, a power company in the Carolinas, estimated that one million to three million customers could lose electricity because of the storm and that it could take weeks to restore. Not everybody was heeding orders to evacuate, however. Antonio Ramirez, a construction worker from El Salvador living in Leland, North Carolina, said he planned to ride out the worst of the weather with his dog Canelo. "The shelters are not taking dogs," Ramirez said. "I'm not leaving him here. In Wilmington, residents who had decided not to evacuate were lining up to get ice from a vending machine -- $2 for a 16-pound (7.2-kilo) bag. "I have no generator," said Petra Langston, a nurse. "I learned from the past to keep the ice in the washing machine." Perched on the porch of his home, carpenter Tony Albright was calmly awaiting Florence's arrival, beer in hand. "I built this house myself, so I'm not worried at all, I know it's solid," he said. "I charged the batteries of my electronic devices, I have beers and video games." "The only thing missing in there is a hot lady."